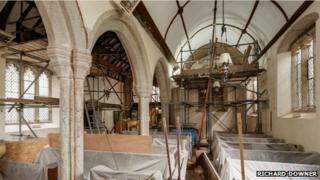 A church which was left with a hole in its roof from a lightning strike has held its first service after having its roof and tower repaired. 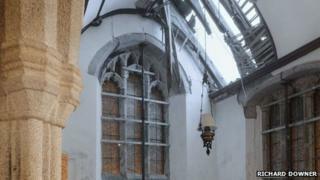 A pinnacle on St Odulph's Church, Pillaton, in Cornwall, was hit during a thunderstorm in January. Blocks of granite weighing up to half a tonne smashed through the church's roof and lodged in the bell tower of the Grade I-listed building. Churchwarden Graham Palmer said almost 100 attended the "excellent" service. He said: "The icing cake was some lovely weather, as some of the service was outside." The repairs cost £370,000, with most of the money coming from an insurance company. 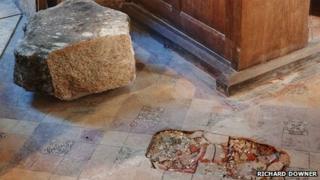 Mr Palmer added that although the repairs were "largely covered by insurance", the works uncovered other problems, such as rotting timbers, which were not covered by the church's policy. He said: "There is still work to do and bills to be paid. "We spent all our reserves, so we are back to square one on fundraising. "We have lots of aspirations and 2014 will be the year of fundraising."